The United States will keep two Patriot missile batteries in Turkey for another year, says Defense Secretary Chuck Hagel. The United States will keep two Patriot missile batteries in Turkey for another year to help bolster the country’s air defenses against threats from Syria’s civil war, the Pentagon said Monday, according to AFP. Defense Secretary Chuck Hagel told Turkey’s visiting Foreign Minister, Ahmet Davutoglu, of Washington’s decision. The two met at the Pentagon for talks that focused on the conflict in Syria. Hagel reportedly “conveyed to Minister Davutoglu that the United States has decided to continue its contribution of two Patriot batteries under NATO command and control for up to one additional year,” Pentagon spokesman Carl Woog said in a statement quoted by AFP. 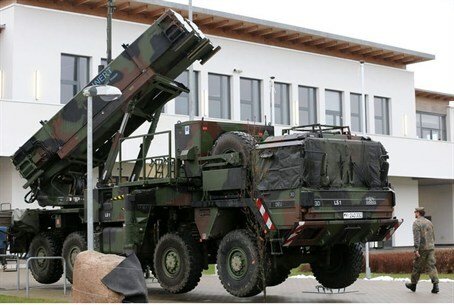 In early 2013, NATO deployed Patriot missile batteries along Turkey’s volatile border with Syria. The United States, the Netherlands and Germany have provided a total of six Patriots for this purpose. Turkey was once an ally of Syrian President Bashar Al-Assad but now backs the opposition fighting to topple the embattled leader. Turkish Prime Minister Recep Tayyip Erdogan has been especially vocal about ousting Assad, branding him “a terrorist who uses state terror”. After a chemical weapons attack near Damascus in August, Erdogan called for military intervention in Syria that would topple Assad’s regime. The heightened tensions between Turkey and Syria have led to several cross-border incidents, including the explosion of a Syrian mortar in Turkish territory, which killed five civilians last year. At Monday’s talks, Hagel and Davutoglu also discussed “the imperative to eliminate the regime’s chemical weapons and achieve a political transition” in Syria, Woog said, according to AFP. Hagel also “praised Turkey’s actions to provide humanitarian relief to the people of Syria.” Ankara has faced an influx of refugees from Syria. In June, the United States sent a Patriot missile battery to Jordan for a military drill, but later decided to keep it there to counter the threat posed by Syria’s civil war.